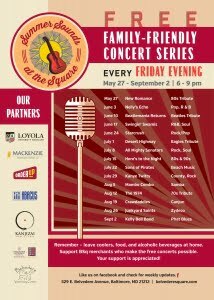 With a festive atmosphere featuring live music from the region’s most popular and emerging bands and with special dining options from the restaurants and Market merchants of the Square, “Summer Sounds @ the Square” has become the place to be on Friday nights, May 27 through September 2. The series is free and open to the public. NEW this year… The Square’s Kanjizai Martial Arts will sponsor Ninja Obstacles, an activity area for kids featuring obstacl…e courses, nerf battles, and more. And on June 10, July 8, and August 12, BARCs brings its BFF Waggin Adoption Van so concert-goers can meet four-legged friends and adopt a dog or cat on site. Also this year, local non-profits and community organizations such as the Govans Branch of the Enoch Pratt Library will be on site on specific days. There’s something for everyone @ the Square this summer. Please note that during the concert season, the 500 – 600 block of E Belvedere Avenue will be closed from 3 – 10:30pm. As in past years, we ask that you please observe a few family-friendly rules: Leave your coolers, food and alcoholic beverages at home. There will be plenty of tasty food and drink options available to purchase from the merchants. For the safety of all the guests, riding skateboards, scooters, bikes or hover boards are not allowed during the event. Please be considerate of the neighbors and park with care in the community. When possible, please park in designated parking lots. Thank you for your continued support. 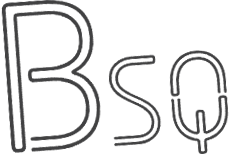 Thanks to our 2016 Summer Sounds @ the Square partners for their support: Loyola University, Mackenzie Management, OrderUp, Abacus, Kanjizai Martial Arts, Berkshire Hathaway/Conklin & Merbler Real Estate, and Belvedere Veterinary Center.